In 2000, Marc Benioff staged the first theatrical protest that Silicon Valley had ever seen. The CEO of a tiny startup that no one had heard of paid actors to carry “anti-software” signs. They marched in front of a user conference for Siebel Systems, which sold customer relationship management software. Later that year, Benioff hosted a military-themed party where guests threw “pieces of software” into trash bins. The ant at the picnic has helped to create a $250 billion global market. Benioff’s company was built around one main idea: that software should be delivered 24/7 to people over the cloud. Salesforce was the first company to do this. In the late 1990s, companies like Oracle and SAP were selling software to businesses that had to be installed and updated on-premise. Now, Oracle, SAP, and the rest of the world are belatedly building cloud products, trying to catch on to the movement that Salesforce started. Salesforce staked a claim by building one of the first cloud products, a CRM tool, and aggressively evangelizing the company’s vision. They sold users on the idea of the cloud around a relatively straightforward product. Then they started building out other products and looking for ways to nurture a growing ecosystem—ideally to drive revenue back to Salesforce. Now, they’re defending their position as an incumbent by building more use cases and improving their own products in direct response to competitors. How did Salesforce so successfully disrupt the market of incumbent, on-premise software providers with a model no one had heard of before? How has Salesforce remained so successful and continued to grow revenue and innovate on their products in an industry that is now crowded with competitors? How can Salesforce continue to grow and innovate while maintaining continuity with their brand? Let’s take a deeper look at how the original SaaS behemoth got its start, and where it can go moving forward. Salesforce’s vision to bring all software to the cloud was revolutionary. But you can’t build a vision in one fell swoop—Salesforce has been bringing their vision to life over the past 18 years. At the beginning, the concept of the cloud was abstract and unwieldy. To actually build their vision, they had to start with just one product. In the late 1990s, there was a lot of activity in the customer relationship management software industry. Competition between big enterprise companies, like Oracle and SAP, was encouraging companies to add more and more features and offerings to their products, making them bulky and complex. But companies still used them because they needed a centralized system to keep track of sales and customer data. The co-founders of Salesforce all had experience working on CRMs and sales force automation. Salesforce set out to make a product that was simpler and easier to use than the bulky products that were available. Theirs would be quick to set up, integrated easily with existing systems, easy to pay for per user, and would always run fast. 2000-2002: Salesforce launched an aggressive marketing strategy around their CRM. It started with the Siebel protests and the “End of Software” party. According to their “anti-software” marketing message, software (or the incumbent, on-premise software) was making life more difficult for salespeople working in CRMs. The messaging on the Salesforce website at the time showed how focused the team was on better product, quicker set-up, and more accessibility. 2003: Salesforce showed that they were willing to make controversial moves to evangelize their product and develop a community. 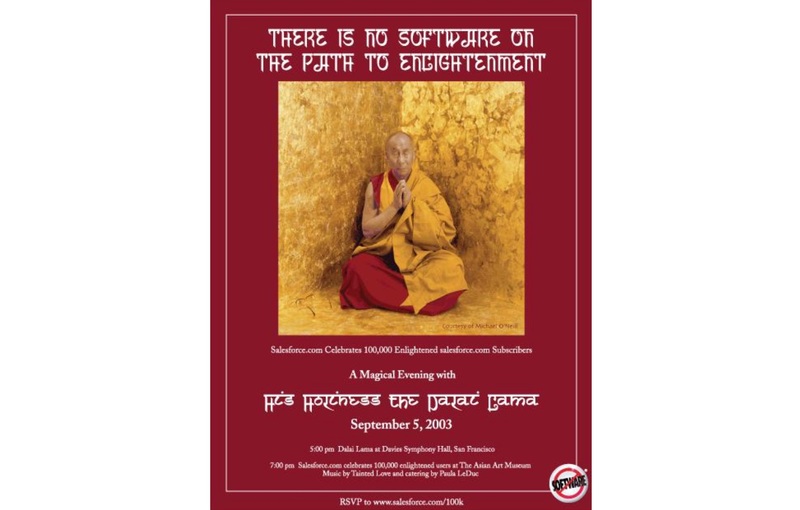 They released an invitation for a celebration of 100,000 Salesforce users that featured the Dalai Lama. It was received with intense criticism and Benioff was forced to apologize. The same year, the company also held its first annual Dreamforce user conference. They started a tradition of announcing new products and ideas at the conference each year. This was the next step in formally building out a Salesforce community and creating enthusiasm around the cloud. 2004: Salesforce announced their IPO. On the first day of trading, the company made headlines as their stock gained over 55% appreciation. The successful IPO was a testament to how Salesforce had built a product people loved, survived the dot-com bubble bursting, continued growing, and successfully started selling people on their vision for the cloud. In these years Salesforce grew by keeping their product, marketing, and sales strategies tightly aligned. Though the idea of a product in the cloud was completely new to users, the value proposition was one that their target audience, salespeople, could easily get behind: a better CRM. That’s exactly what Salesforce delivered on. Though the team believed their early product was “bare bones to a fault,” that’s exactly what customers were looking for. Compared to the complicated and buggy CRMs of Siebel and SAP, Salesforce’s tool was streamlined and simple. That these early users were salespeople—and not any other role in the customers’ companies—was a critical part of Salesforce’s marketing strategy. For most companies, sales is a revenue center—and sales teams are often willing to invest in new tech if it means reaching their revenue goals more effectively. As a result, Salesforce could directly show how its product helped a company make more money. 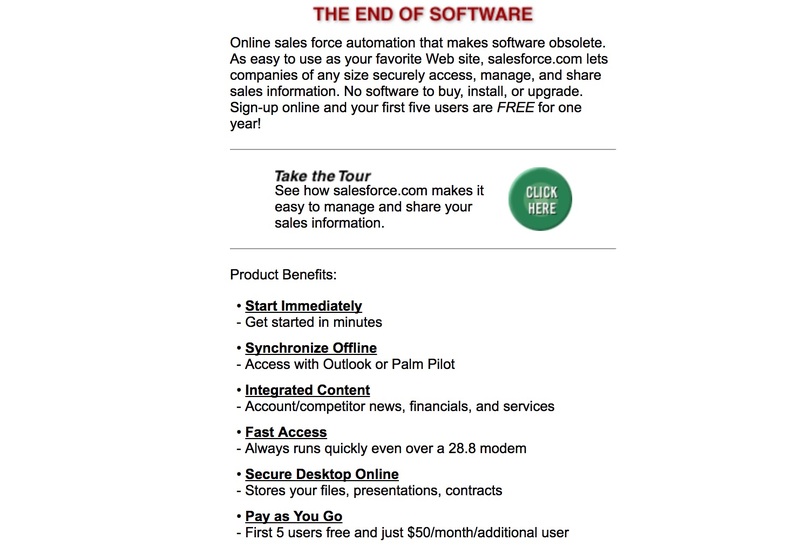 Salesforce essentially invented the free trail and a new model for selling software. The product was a software-as-a-service product delivered over the cloud, which created a powerful viral distribution channel among these early users. Since the product didn’t require any setup, it was technically possible for Salesforce to offer the tool for free. So they created a plan where the first five users at any company could use the CRM free of charge. Once a team member tried it and liked it, scaling up the team was easy thanks to Salesforce’s straightforward pricing plan. They could scale up by seat or by upgrading to more functionality. Giving customers two ways to expand also helped fuel geometric revenue growth for Salesforce. Selling an easy-to-use product with a viral distribution model to an amenable market helped Salesforce achieve high capital efficiency. This allowed the company to keep investing back into their growth engine. These sales and marketing practices also fueled unusually high revenue growth. The company had over 100% compounded annual growth rate from 2001-2003. The combination of a user-friendly product and a viral distribution channel helped the company to grow from $5.9 million in revenue in 2001 to $50.9 million in 2003, when they filed for IPO. During their 2004 IPO, the company was doing $96 million in ARR, and was valued at $1.1 billion. Salesforce was establishing the company as a CRM disruptor in the cloud—and still relied on their CRM as the main product. But Benioff’s vision was much bigger than a CRM. When Salesforce started selling a CRM in the cloud, they were the first and only SaaS company. Their competition was the incumbent, on-premise CRM software. But this changed as the company grew. Salesforce’s early success heralded the rise of many new cloud businesses. Companies saw that this delivery model allowed them to build and distribute products to more users, faster. Instead of adopting a hostile attitude toward these new SaaS companies, Salesforce leaned in. They built a platform where developers could build custom applications on top of Salesforce, and created a central community where Salesforce users could build and sell their apps. They also started expanding their core offerings beyond a CRM by acquiring other SaaS companies and repurposing them within their own suite of products. By expanding to offer more cloud products—like support and collaboration tools—they cast a wider net to bring users into Salesforce. That made the ecosystem more attractive for developers to build on, which in turn increased the value of Salesforce’s offerings. The more the cloud grew, the more Salesforce grew. 2005: Salesforce built the AppExchange. Here, third-party developers could create their own apps and sell them to a community of other Salesforce users. This was the next logical step in nurturing a growing cloud computing industry, because it gave developers a supportive community and audience. 2006: The Salesforce team laid more bricks by releasing Apex, an on-demand programming language that allowed third-party programmers to write and run code on Salesforce’s multi-tenant, shared architecture. Parker Harris also created Visualforce, which allowed users to create any user interface they wanted and build forms, buttons, links, and embed anything. 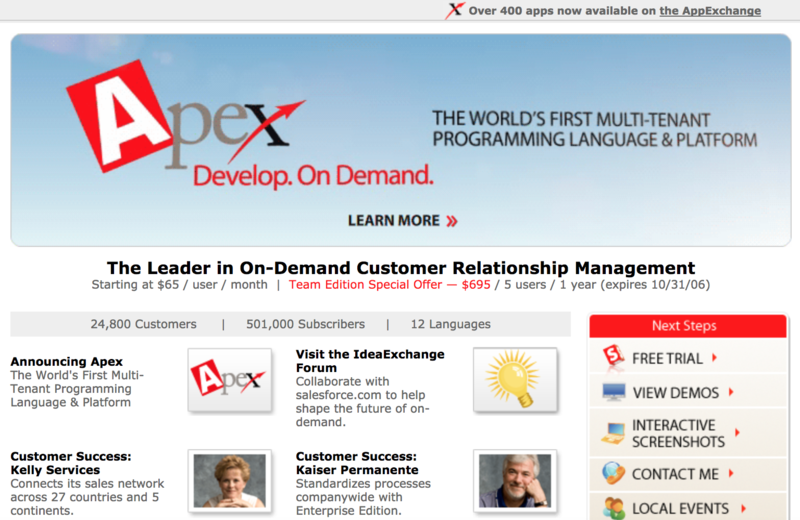 2008: Salesforce released an official platform for developers, Force.com. This was the world’s first platform-as-a-service. It allowed third parties to deploy apps on Salesforce’s architecture. It also created a new revenue stream for Salesforce, as third parties paid per login to use the platform. 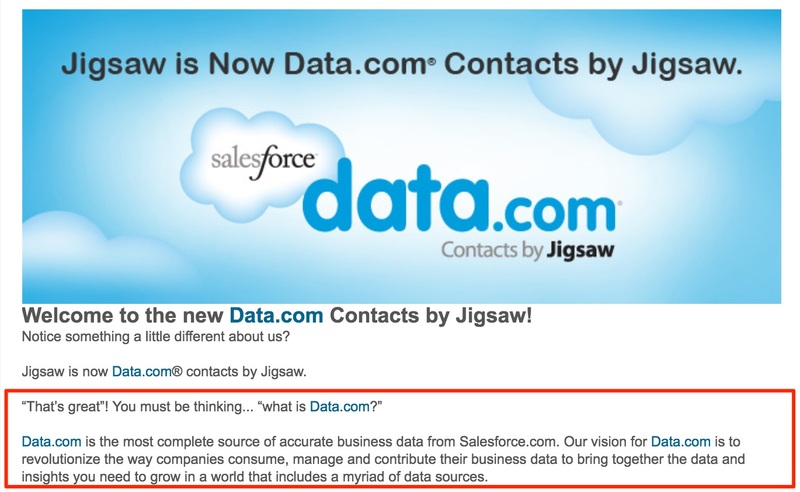 2011: Salesforce repurposed the acquired crowd-sourced data company Jigsaw as Data.com. Acquisitions like these helped Salesforce extend their reach in the SaaS industry with different arms, adding new revenue centers along the way. 2012: Salesforce repurposed the acquired social customer service tool Assistly as Desk.com. Salesforce had made an earlier investment in the startup, and finally bought it in 2011 for $80 million. The acquisition helped Salesforce turn Desk.com into a social help desk. The tool could draw on data from the Salesforce CRM to provide a more integrated experience for customers. This new product offering continued to expand their products’ use cases, and the company’s revenue centers. 2013: Salesforce repurposed the acquired social media monitoring platform Radian 6 as Social.com to allow customers to integrate social media data and CRM data. The company continued to expand their offerings on their Marketing Cloud. That same year, Salesforce hit a milestone with 2 million apps downloaded and installed on the AppExchange. This demonstrated the success and growth of the company as a platform provider, not just a CRM provider. Over these years, after early marketing around the CRM had started generating excitement about the cloud, Salesforce began building out other products. Now they weren’t just selling the cloud vision alongside their CRM. They were evangelizing the vision to other developers, who were also starting to build cloud apps through the Salesforce PaaS. At the same time, they invested heavily in acquiring other SaaS companies. This helped them create even more ways for people to use Salesforce. This value proposition demonstrates Salesforce’s leadership in the SaaS industry, as well as their continued commitment to making software more accessible. In the same vein as their very first product, the CRM, Force.com’s introductory-friendly pricing drove acquisition and distribution. At just 99-cents-per-login, the price tag made it really easy for companies to get started building and deploying on Force.com. The pricing scaled by usage, which meant that as customers’ apps became more successful, Salesforce profited, too. Salesforce was intentionally building many revenue centers with their CRM product, Force.com, Data.com, Desk.com, and Social.com. Their revenue growth during this time was hundreds of millions of dollars higher than the public SaaS median. 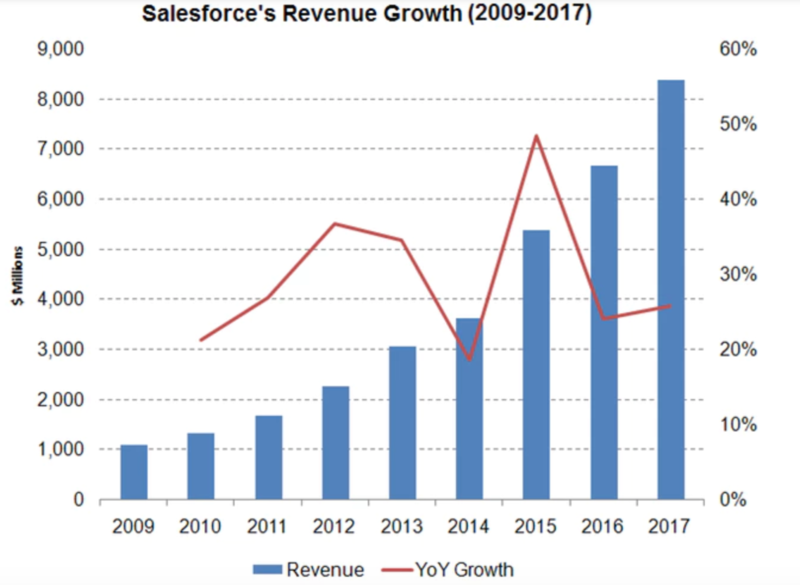 Salesforce revenue growth from 2004-2006. Now, the company was expanding beyond a CRM product and helping customers across many services. The CRM had simply provided an entry point to what Benioff and Salesforce had always envisioned: a world without software, entirely on the cloud. 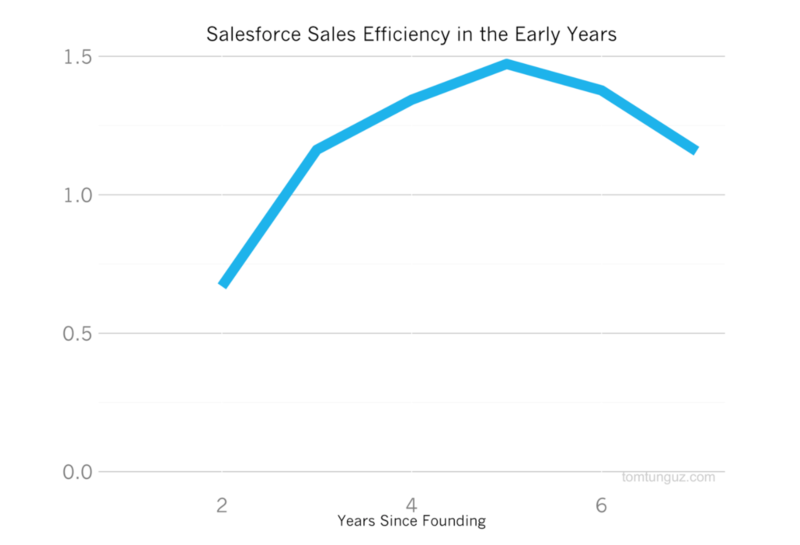 By the time Salesforce was around 15 years old, the company had become the incumbent in the industry they pioneered. As they move forward, they’re seeing smaller, nimbler startups enter their turf. They’re also seeing competition from other incumbents, like Microsoft and Oracle, who have now moved their products to the cloud. In order to survive against threats of competition from companies like Microsoft and Oracle, Salesforce has shifted their strategy. Instead of nurturing up-and-coming SaaS companies, they’re competing head-to-head with the ones that threaten Salesforce’s growth. They are no longer primarily focused on creating tools, resources, and communities where others can build. Instead, they’ve doubled down on utilizing the latest technology to improve their own products in direct response to competitors’ moves. This has resulted in horizontal and vertical expansion. They’re focused on improving their CRM by quickly adopting and integrating the newest technology and making it available to customers of all sizes. At the same time, they need to keep adding new cloud services to serve a wide breadth of use cases and compete with other enterprise providers, like Microsoft and Oracle. 2015: Salesforce released SalesforceIQ, a CRM for small businesses. As Salesforce grew into an enterprise solution, they left room for other companies to come in and capture the SMB market. To counter this, Salesforce acquired the relationship intelligence platform RelateIQ in 2014 and rebranded it as SalesforceIQ. The value prop sounded similar to Salesforce’s original CRM from 1999: an easy-to-use, out-of-the-box solution that a team could start using in minutes on a free trial. 2016: Salesforce acquired Quip, the productivity software company, which allows users to create documents and spreadsheets. This productivity arm provides a huge new breadth of use and competes directly with Microsoft Office and Google Docs. In the same year, Salesforce acquired e-commerce platform Demandware. This helped them build out Commerce Cloud and start offering e-commerce services within the Salesforce Suite. In 2016, Salesforce also released Salesforce Einstein. This brings AI technology to their now-huge range of products, and allows Force.com users to build AI-powered apps. Salesforce announced Einstein in the same week that Oracle released an AI initiative for their CRM with their Adaptive Intelligence Apps. A few months later Microsoft announced AI developments in their CRM with Microsoft Dynamics 365. As Salesforce faces competition from other CRMs and other business software, they keep creating more “clouds,” or products that served specific functions, to get users into the Salesforce suite. Once they start using one product, it’s easier to cross-sell them on others. The product sprawl is also necessary to compete with other large cloud CRMs. By improving their existing products with new technology like AI, and giving developers the tools to build AI-powered apps, Salesforce can continue to make really powerful technology easier for people to use. This doesn’t mean that new technology like AI is enough to keep Salesforce competitive—especially since other companies are also making strong pushes to incorporate AI. But in combination with their other cloud acquisitions that allow them to provide more product offerings to users, Salesforce can continue to strengthen itself as a platform and suite that has grown much, much larger than just a CRM. 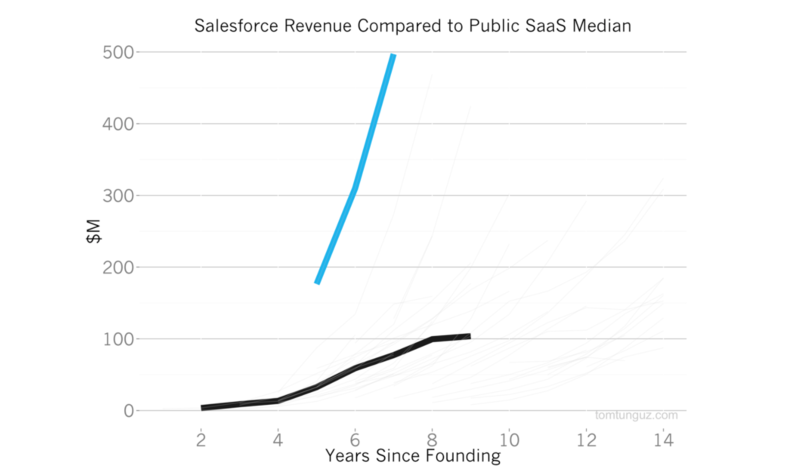 Salesforce’s revenue growth and growth rate. As of 2017, their revenue for the year is exceeding $8 billion and their growth rate is just under 30% YoY. The company is facing threats from many sides, but they’re still pushing forward. Salesforce is now the premier cloud SaaS incumbent. That means they have a lot to lose. Though they’ve invested heavily in the SaaS ecosystem—and in many ways helped other companies grow—they’ve also created room for other companies to move their legacy products to the cloud and left openings for smaller and cheaper solutions to chip away at their customer base. Provide network services within their suite of cloud products. Acquisitions have helped Salesforce expand into completely new categories. But Salesforce has yet to make a significant expansion into a network—they lost a bid to acquire LinkedIn last year to Microsoft. They’ve already laid the foundation for a network with strong communities through their Dreamforce Conferences and their AppExchange and Force.com platform. Creating a network within could help them own the data and network layer above their sales, marketing, and collaboration clouds. Bring better AI utility to their customers. Salesforce is already in the process of incorporating AI into many of its products. This is in part due to a 2017 partnership with IBM to combine Einstein and Watson, to allow customers to augment their data that’s already in Salesforce. But with more data comes more complexity, and a lot of people already think Salesforce is too complex. Meanwhile, many new products are focused on ease of use. Salesforce can use AI to make it easier for users to get the information they need from their products, especially since they already have an internal tool called Optimus Prime to organize and clean data. This would be a big opportunity to add services around all of the data that users already have in Salesforce. Focus on international markets. Salesforce grew by focusing on the U.S., but they now have an opportunity to grow more aggressively by expanding overseas. Just last year, they made a deal with AWS to expand their partnership; now, Salesforce doesn’t have to build data centers from scratch in countries with data sovereignty laws. However, they are still building their own data centers where it makes sense; they built their second data center in Japan earlier this year in response to increased usage across the Asia-Pacific region. In international regions that are continuing to grow, building their own data centers gives Salesforce more of an advantage, allowing them to better service more geographic regions without relying on rented resources from companies like Amazon and Microsoft. Salesforce’s continued reign in cloud SaaS will depend on how well they can keep innovating on their products and offering more as a cloud solution. This has been their playbook and it’s what has brought users the most benefit and success over the last 18 years. The way that Salesforce completely moved the entire software industry to the cloud was revolutionary. But users never would have paid them any attention or cared about their cloud movement if they’d been selling a crappy product. Salesforce created a CRM and put it in the cloud so that they could get users excited about cloud products. Then, they used their position as the cloud leader to build out more (and better) products that users wanted, and that fueled their own growth. If you’re building your own product, there are a lot of lessons you can learn from Salesforce’s journey. 1. How can you improve a current tool or process? Salesforce’s cloud CRM and their “no software” campaign were based entirely on the idea that on-premise software was too hard to install and upgrade, and that users would want something easier. 2. What is your company’s brand, and how does that impact your products? Salesforce’s emphasis on making things easier and on being seen as an innovator informed their product decisions as they grew. A well-defined brand can help keep your product development focused. Send out an NPS survey and focus on qualitative answers. In addition to asking users to provide a numerical score, leave an open-ended field for users to leave written feedback on their experience with your brand. You can then organize your survey responses with a word cloud generator, like I did here with Slack. Create a spreadsheet to categorize value. In the spreadsheet, connect each of your product offerings to the value for users, as well as the value for your brand. Visualizing your product offerings like this will allow you to see how your product is— or is not—connecting to the main marketing message you want to send to customers. 3. How can you make yourself more valuable as competition increases? As Tom Tunguz explains, three enduring competitive advantages for SaaS companies are network effects, data network effects, and ecosystem creation. Salesforce created an ecosystem because that was the best fit for them in the emerging SaaS market at the time. Understand why users would choose a competitor. Post a question on a forum to ask real users, “Why are people using [X] product?” Choose a product that is competitive to your product. Asking this question can also show you what users are not getting from a competing product. This helps you to carve out a distinct niche that gives users something they’re not already getting, and is valuable in a unique way. Release free tools to let people see for themselves how useful your product is. In a very competitive environment where there’s a lot to gain or where customers may not immediately understand the value of your product, merely getting them to try it can be difficult. Free tools, or free tiers like Salesforce’s very first CRM, can help get your product in front of a wide audience and allow users to explore the value of your product for themselves. I always like to say that there are no shortcuts. Growth hacks and pickaxes work in the short term, but they don’t set you up for the kind of growth that Salesforce has achieved. For that, you need a vision and a never-ending list of ways to make that vision a reality. There’s no way that Salesforce would have gotten to where it is today if they’d just peddled a CRM. Their CRM was a crowbar that let them pry their way into the cloud space. But what made them successful was that they kept finding new ways to execute on cloud products and evangelize their vision. Salesforce certainly set a high bar for SaaS companies in 1999 when it started growing and didn’t stop. Now, they need to live up to their own precedent, or risk being overtaken. If they keep finding new ways to execute on their strategy from 1999, they’ll continue to be one of the key players in the SaaS industry.